Kelly pulled into the harbor parking lot next to the pier and noticed that Amber’s car wasn’t in its usual place and there was no sign of her. She was usually standing at the door of Kelly’s Koffee Shop, waiting for Kelly to open up. Wonder what that’s all about, she thought. The local residents of Cedar Bay come to Kelly’s Koffee Shop for breakfast, lunch, and lots of gossip. Kelly serves it all up as she works to solve the murder of the high school Homecoming Queen. The townspeople can’t believe what has happened in their sleepy little Oregon seaside town. She identifies five prime suspects, but which one did it? Follow Kelly, her boxer dog, Rebel, and her boyfriend, Mike, the county sheriff, as they try to determine who the killer is in a murder that’s shocked the town. Kelly’s Coffee Shop is a mouth-watering cozy mystery with recipes. This was a very quick read that kept my attention from the time I started it till I put it down. This is a book you could finish easily in one setting. It had a great plot and the conclusion came together very well. This book kept me guessing and I had no idea how it would end and was totally surprised. 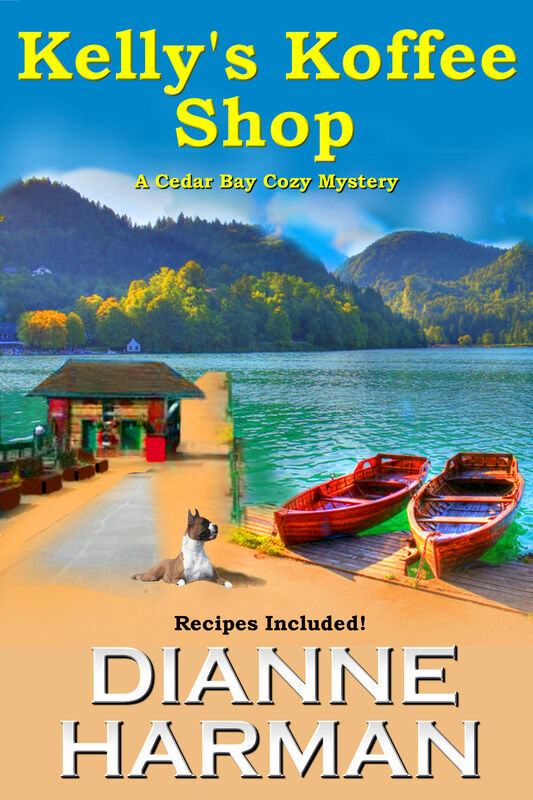 I say great job Dianne, I look forward to reading more about Kelly and the town of Cedar Bay. 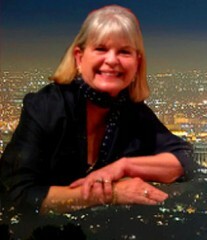 Dianne lives in Huntington Beach, California with her husband Tom, a former California State Senator, and is a frequent contributor to the Huffington Post. People are always asking me why I decided to write a cozy mystery, since my three books in the Coyote Series were in the genres of mystery and suspense. Very simply, II wanted to write something that would allow me to focus on two of my passions: food and dogs. I’ve been fortunate to attend cooking schools throughout the world and have had a lot of dogs over the years. A cozy mystery seemed like the best way to combine these two things, although I’m told there’s a lot of food in most of my books, particularly Coyote in Provence. Another question I’m frequently asked is why the setting is of a coffee shop. I love to cook and having a protagonist who owned a coffee shop was a natural. I also have read some books where recipes are included and I decided to do that. These are my recipes or family recipes, all tested and cooked by me! As far as Rebel, the dog in the book, I suppose it was a chance for me to pay homage to a boxer of mine who we had to say goodbye to this year by the name of Rebel. The dog in the book is very similar to mine, but my husband is not based on Mike! Several people have told me that changing genres would be a very risky thing to do, particularly since books in the Coyote Series had been best-selling award winners. They strongly suggested that I use a pen name. I vacillated for over a year about writing in this genre. The interesting thing is that the book practically wrote itself. We were on a vacation and I jotted down some notes in bed one morning while I drank coffee. I started to write it the day after I returned and three weeks later it was on Amazon and has been a phenomenal success. At the moment it’s the #1 bestseller in Cozy Mysteries – both in culinary and animals. I’m doing a Happy Dance every day! I never started out to write a series, it just happened. Toward the end of Kelly’s I started thinking about the next book, Murder at Jade Cove, which was published a few weeks ago, and is presently the #2 bestseller in Cozy Mysteries – both in culinary and animals, right behind Kelly’s Koffee Shop! Last week I published the third in the series, White Cloud Retreat, and it’s already a Hot New Release and in the top four of culinary and animals. I’m in the middle of the final editing of the fourth in the series, Murder and Marriage, and I expect it to be out in a few weeks. I’ve never had so much fun! The characters are telling me what to write, so I’m reading a novel while I’m writing it. As to where this will all lead, I have no idea. We’re getting a little boxer puppy on Valentine’s Day. Who knows? Maybe the puppy will spark a series! Thank you very much for having me as a guest. A few months ago I never thought I’d publish a cozy mystery. Who knows what the future holds? This looks like a fun read just to sit and enjoy with a cup of tea! My comment the other day has not appeared so am entering one today. Like the colorful cover and your bright smile, Dianne.